A moment at the start of their journey and building the father & daughter bond together and i don't know how anyone who has watched it didn't find Ushio simply adorable! Its also my first time painting a scenic background so go easy on me if the standard isn't brilliant XD im trying to improve! 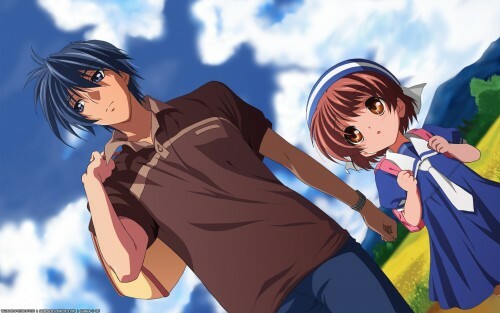 Not a Clannad fan..yet, maybe I should see the afterstory. Good vector, clean and smooth lines., I like the hill, and the tree good job on them. this is so lovely I was hoping someone would do that image! The vector is great, very smooth. And it's your first time painting a scenic bg? As I said on AP, is awesome. I can't think of anything to say besides good job with the vector. Composition, lighting, texturing, etc are pretty much the same as the scan. Maybe changing the background scenery to something a little bit different or even the time of day (dusk, maybe) would have been nice; therefore giving the wallpaper a more unique feel from its main source (scan). Wow, another great vector of Clannad, thank you very much. this wall is so PRETTY! i really like the colors! got it from the anime right! nice work! T_T ohh! thanks for this wall! Nice work!